'SHENJI Birmans' (now 'Borealis Birmans') is situated on a two-acre property 50 km from Melbourne, Victoria, in Australia. Breeding cats have outdoor runs, climbing frames, shade-cloth, choice of beds, and a natural environment from which they can enjoy the sunshine and views. Kittens are raised indoors for safety and 'socialising'. 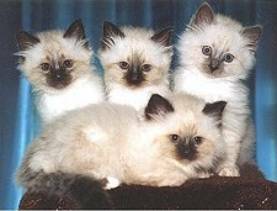 My breeding cats are from show-winning backgrounds and are mainly pure seal point and blue point lines, to retain the classic Birman look and type. Desexed pets or show neuters are available most of the year to suitable, loving homes, and can be viewed at my cattery by pre-arranged appointment. Un-desexed cats are only sold to officially registered cat-breeders with approved catteries, and preferably an active showing career. My name is Loraine Smith, and I have been a cat-lover my whole life, always having had at least two cats in my household. I fell in love with a friend's Birman in 1985, and one of her kittens, Chereby Benjamin Luke ("Benji") became my beloved pet for more than 16 years. When I migrated to Australia from the UK in 1988, Benji and his longhaired moggy friend, Sherry came with me. When Sherry passed on in old age, I decided to fulfil my ambitions to breed the ultimate pedigree cat, the lovely Birman. Choosing 'Shenji' - a combination of Sherry and Benji - as my prefix, I purchased a blue point female, Eldorato Jessamine Leia ('Jessie'). Her first litter produced Gold Champion of Champions Shenji Callista Sarah, pictured at the top of this website. 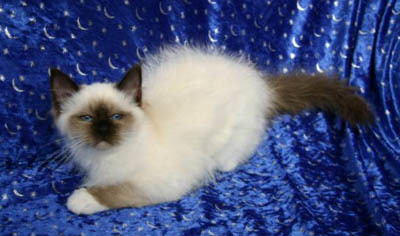 Using a seal point stud with USA lines, Double Gold Champion Eldorato Anakin Solo, Jessie produced my seal stud, Double Gold Champion Shenji Anakin. From one of Anakin's litters, I kept a lovely seal point boy as my pet and show neuter, CCCA Champion & Gold Premiere Neuter Shenji Aslan d'Or, GCCF (Vic)'s Best Longhair Neuter of 1999 and 2000, pictured below. Nicknamed 'Lando', he is my favourite Birman and pampered household pet. To further improve my lines, I purchased CCCA Champion/Gold Champion Eldorato Zabeal (Hons) and CCCA Champion/Gold Champion Shekinah Ali Khan from two of the best catteries in Victoria. They produced beautiful kittens as breeders, pets or show neuters both in Australia and overseas. I have kept a lilac point stud boy, Shenji Zorba, from Double Gold Champion Sharada ShadesoBlue, and am planning to commence a 'colour' line this year. My classic seal/blue line, however, will continue in its purity, separate from the 'other colours'. All Shenji kittens are raised with their parents and are fully socialised, well accustomed to being picked up and cuddled. They are vaccinated against 'flu and enteritis, thoroughly vet-checked prior to sale, and pet kittens are desexed and microchipped at 10 weeks. Breeding queens and studs are tested FIV/FeLV-negative. When available, kittens and and their parents can be visited by appointment at my cattery in Cranbourne: please phone (03) 5998 5506 and leave a message during working hours. I will return your call in the evening. Click on Shenji Zorba's photo below to see a collection of typical kittens. A special addition to my cattery was made in 1997, by way of my Norwegian Forest Cats (NFCs). 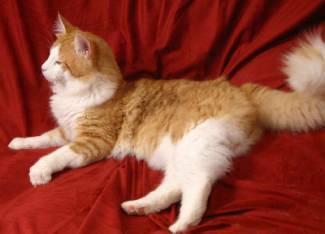 My first stud was Gold Champion Firecrystal Prins Ymir, the first registered Norwegian Forest Cat in Victoria and from the first litter to be born in Australia. 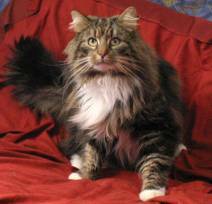 Ymir was a Blue Silver Tabby with White and an alert and affectionate personality. He retired to a friend near Shepparton, but I kept his son, Double Grand Champion Borealis Indiana, who was the same colour and pattern as his sire. In 2000, I imported a pure white Norwegian Forest Cat from Scandinavian lines. Double Grand Champion Abbatini av Operahuset and his 'harem' of females from various top European lines produced some lovely kittens. One of these was CCCA Champion and Gold Champion Borealis Asgard (below), unashamedly my favourite cat in the world! I also imported a lovely tortie tabby and white female from Denmark, Double Gold Champion DK Dansberg's Felisia , and a huge red tabby and white stud boy from UK and Danish lines, Gold Champion Catwo Sun Seeker ('Sunny'), whose progeny continues to delight people at cat shows with their adorably confident, show-off natures and loud purrs. their progress can be followed on my website, see 'Litters'. This Birman Cat Ring site is owned by Loraine Smith. Ring Owner: Birman Websites with Purrsonality!